Readers will feel as though Harry Potter is meeting Alice in Wonderland in this first of a new series. 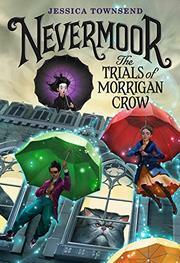 Morrigan Crow, a pale, white child, was born cursed. She’s the town scapegoat, blamed for everything bad that happens in Jackalfax. All cursed children are expected to live for 12 years, and as Morrigan is about to turn 11, she has one year until she dies on Eventide, when the old Age gives way to the new. Unfortunately, experts have incorrectly predicted the length of this Age, and Morrigan will die in just a few days. With not even a year’s worth of a future, things look bleak, but then the letter arrives. It’s an invitation to compete for a coveted spot in the prestigious Wundrous Society. On the day she’s to die, Morrigan’s new patron, white, freckled, and very gingery Jupiter North, whisks her away to Nevermoor, where the competition takes place. Successful completion of the four trials of the competition will earn Morrigan lifelong Society membership, giving her what she’s always wanted: to belong. If she fails she must go home, where the Hunt of Smoke and Shadow (the death of all cursed children) will kill her. Several important secondary characters have brown or dark skin, including Jupiter’s nephew, Jack. The geography, politics, and magic of Morrigan’s world are created with care, and Morrigan is a brave free-thinker readers will look forward to meeting again.